When some people hear “burgundy wine,” they immediately think of red wine. “Burgundy” does not refer to the color of the wine, however, but to the region of France in which the wine is made. 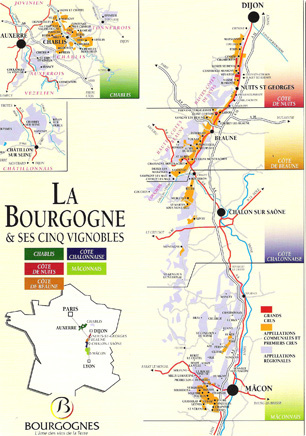 That region is called “La Bourgogne” in French. We translate it “Burgundy” in English. Some of the world’s finest red and white wines are produced in this storied region. These sought-after red wines are made entirely from the Pinot Noir grape, and the world-famous white wines are made entirely from the Chardonnay grape. While these wines are known throughout the world, few people realize that Burgundy is by far the smallest major wine-growing region in the world. In fact, the heart of Burgundy is only about 30 miles long by one mile wide – tiny by wine standards. Obviously, the villages are tiny, too, and are a mere kilometer or two apart. Herein lies one of the most complicated aspects of Burgundy – namely, the terrain presents a compact arrangement of microclimates. These microclimates present a complex assortment of altitudes, slopes, exposures and soil types. Literally, two vineyards separated by a stone wall or a dirt road will produce grapes that make wines which can be very different in flavor as well as quality. It’s no wonder that Burgundy produces a greater variety of single-grape wines than any other region in the world… and it’s also no wonder that Burgundy can be a minefield for the wine lover in the United States. 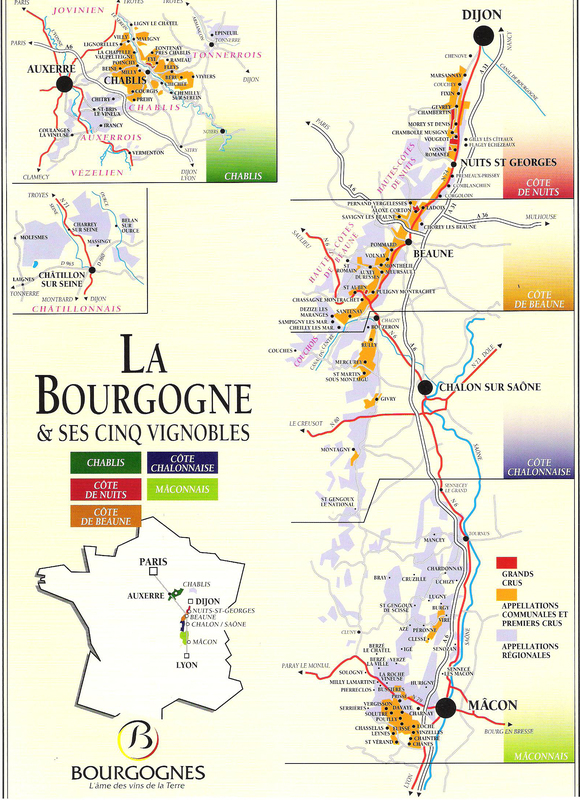 Wines made in Burgundy receive their quality classifications, called appellations, based on the region, village or individual vineyard in which the grapes are grown. In most cases, the more defined the growing area of the grapes, the more consistent the quality of the wine produced by those grapes. Oftentimes, the finest wines are produced by vineyards that are no more than a few football fields in size.